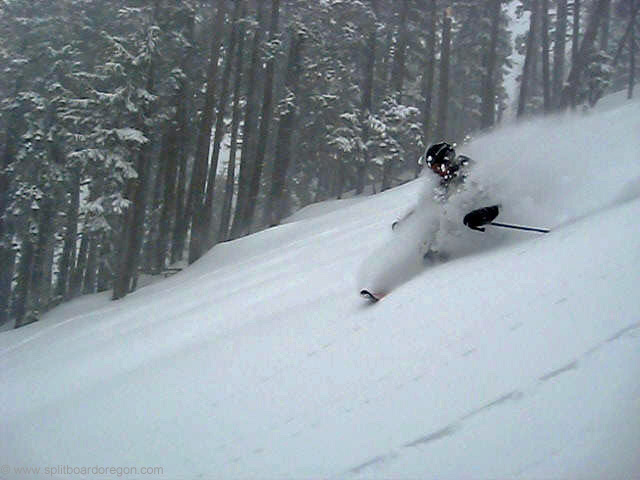 “I can’t believe I’m choking on face shots in Late April!” That’s what I remember thinking as I dropped in for one of the best runs of the season at Willamette Pass. The day started out with Todd and I leaving work around 3:00 pm, heading up to the Pass for our 2nd annual Willamette Pass Dusk Patrol. A storm had moved through the region in the morning and I was checking the web cams from work hoping we might score. When we got to the Pass around 4:30 it was still snowing and about 28 degrees. We shouldered our packs and started skinning up By George, and the sun poked out through the clouds. By the time we reached mid-mountain, it was snowing again pretty hard. We skinned up Timbur Glades to the top, and conditions were quite different this year than last. After sitting on the chair at the top of EPA and having the obligatory IPA, it was time to sample the goods. I was on my Neversummer Titan 164, and I’m glad I had my bigger board, becasue the snow was deep! We chose to ride back down Timbur Glades, and our skin track was filling in from just the hour before. The first few turns were awesome, and we took turns shooting video of each other. 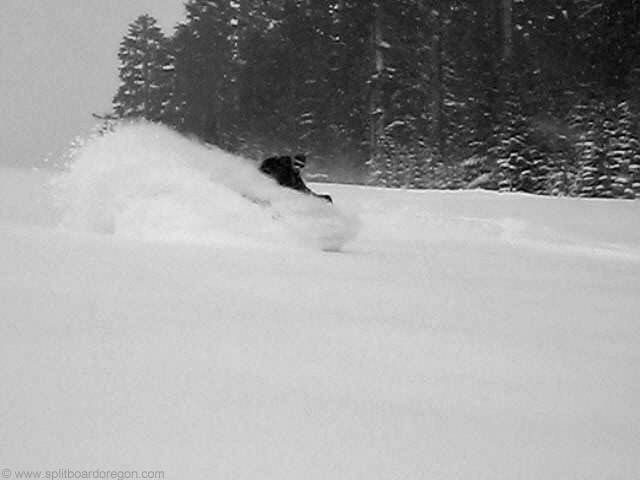 I couldn’t believe how light the snow was, and we kept getting face shots on every turn. Halfway down the run, I grabbed the camera from Todd and shot a video of him getting the goods. 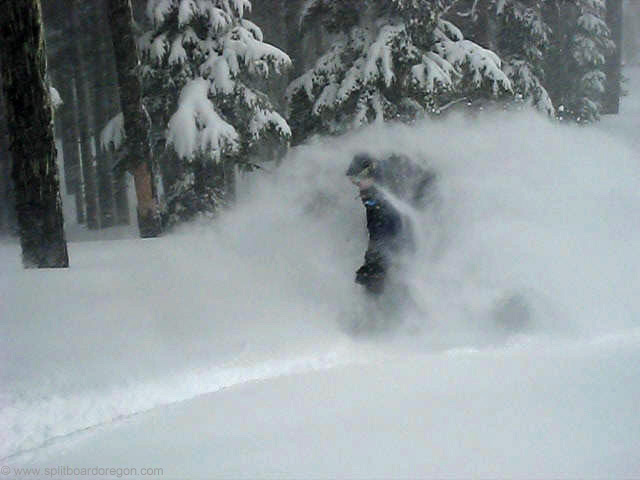 Here’s a shot of him in the light stuff…..
We continued down to By George and made more turns, getting face shots each time. At mid-mountain, we contemplated going back up, but decided to head down given the fact that it was getting dark. The turns all the way down to the truck were awesome! 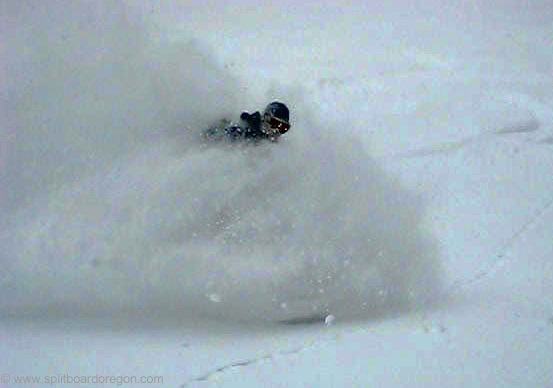 The 2008 season has been a great one, and this was probably some of the best pow I had all year long! I can’t wait until next year’s dusk patrol!